Ever had writer’s block? Did you ever feel like what you had to write about just wasn’t very exciting? Well, that is exactly how Ralph feels in this charming metafiction tale. While everyone else in class seems to be able to produce volumes at writing time, Ralph doesn’t know how to begin to record even the mundane. His teacher insists that “Stories are everywhere!”, but when he stares out the window, at his paper, and at the ceiling, nothing seems to inspire him…until he lays under his desk, hiding, yet pretending to find inspiration. And then something happens when the teacher asks Ralph about his story, he has one! Abby Hanlon’s line drawings capture the emotion of a budding writer in elementary school. This fun read-aloud is well-suited for a second grade class; this new book is an instant classic because any reader can relate. To reinforce comprehension, students may be asked to describe what techniques didn’t work to help Ralph get over his writer’s block and what helps them to personally clear away the fog that keeps them from completing assignments. As a teacher herself, Hanlon is familiar with students’ struggles with finding their stories. What I love most about this book is that Ralph is shown writing and brainstorming all over the room. His teacher is not caught up in his sitting on his bottom at his desk; Ralph’s teacher in encouraging and understanding of Ralph’s need to get up and move to find inspiration. 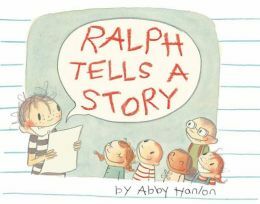 Ralph Tells a Story is a must-have for any elementary classroom library.